Photos show fruit marked "Israel"
Fears that an Iranian ban on imports from its arch foe Israel was flouted by the sale of Jaffa oranges have sparked an inquiry in Tehran, reports say. 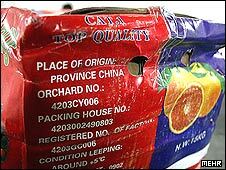 City authorities asked the judiciary to take action after the Israeli fruit was allegedly imported in boxes marked as Chinese, local media report. The fruit was imported via Dubai and put on sale at markets and in shops in and around Tehran, one report says. A news agency showed pictures of boxes containing fruit bearing a Jaffa label. In its report on the alleged distribution of the oranges, the Ilna news agency said fruit still in storage would not be sold. 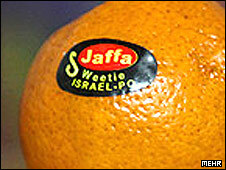 Photos show the alleged orange boxes marked "China"
Photos released by the Mehr news agency show oranges clearly marked "Jaffa Sweetie Israel PO". An Iranian customs official later told a third news agency, Isna, he found the reports impossible to believe but added that if any Israeli oranges had been imported, it could only have happened through unofficial channels. "In addition to the inspections, importers are informed about the laws and they will never take such risks for importing just a few tonnes of goods," said Mohammad Reza Naderi, deputy head of Iranian Customs. "Even if it is said that the oranges were imported to the country from Israel, the import was not done through official channels." The Jaffa orange, named after a city in Israel, is known for its sweetness, for having few seeds and being easy to peel.